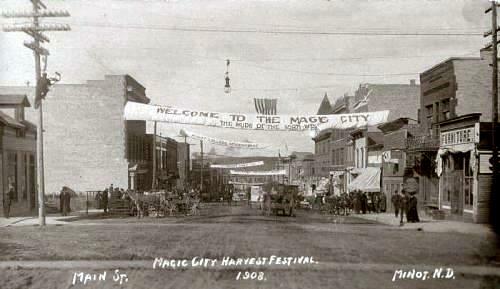 July 6, 1912 Minot Daily Optic – 101 Ranch Real Wild West Show – On July 10, 1912 the Wild West show was coming to Minot. 50 cents was the admission and they featured two shows, rain or shine. 101 Ranch Wild West Show claimed to be the largest exclusive western show in existence showing the west as it was. The show featured Dusky Demon of Oklahoma, the only man in human history who fought barehanded a Spanish Bull. The show also had Cowboys, wild west girls, Indians, homesteaders, pony express, senoritas, vacqueros, buffalos, bucking horses and long horned steers. It claimed to show the history of frontier life. The Wild West Show also held a parade in the morning of the day of the event.